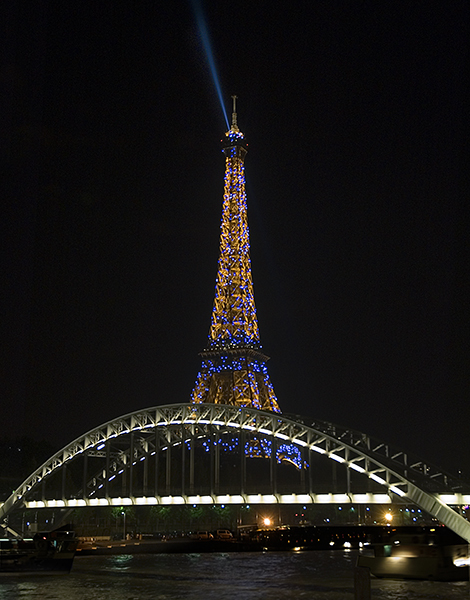 Today marks the 126th anniversary of the opening of the Eiffel Tower. What better way to note the occasion than to post one of my first images of it? 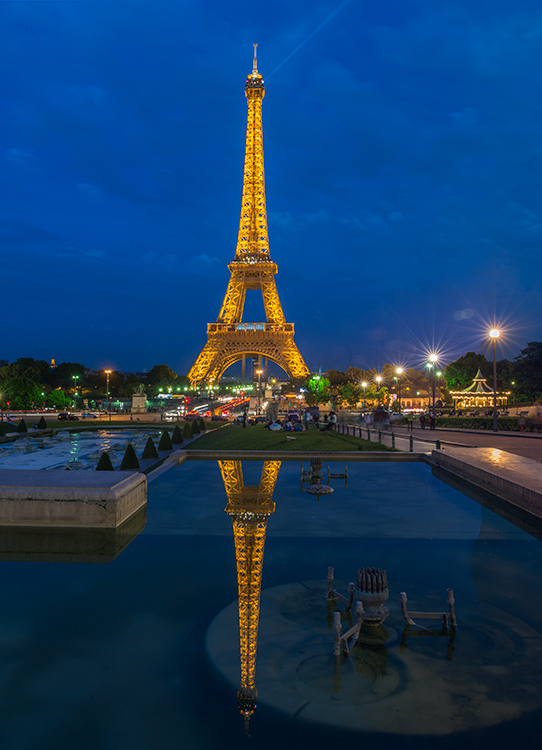 The tower was the main exhibit at the 1889 Exposition Universelle (World’s Fair), held to commemorate the centennial of the French Revolution. The arched bridge in the foreground is the Passarelle Debilly, a footbridge constructed for the same Exposition. Both were intended to be temporary structures, but fortunately both escaped that fate. The bridge, however, was moved from its original location not far away to where it stands today. To see a few more pictures of Paris check my website here. My submission to Stacy Fischer’s After-Before Friday Forum this week is from a recent trip to Paris (which is pretty obvious when one looks at the image). I am often shooting cityscapes during twilight and one of the challenges in these circumstances is exposing for extremely bright lights scattered across an otherwise very dark scene. 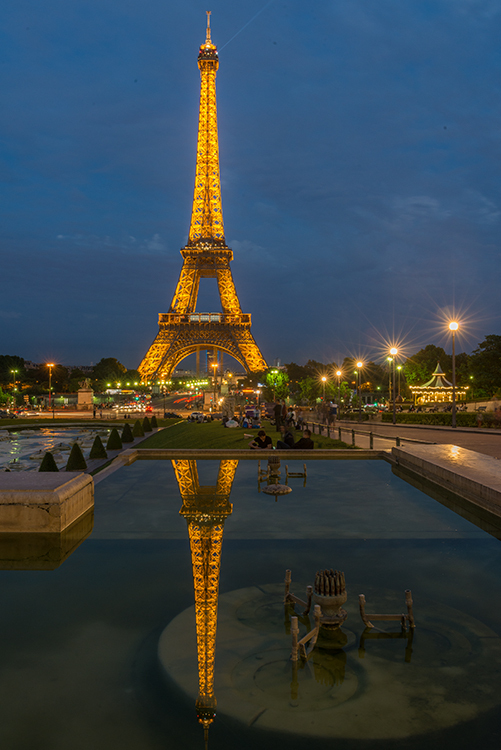 Such was the case with this twilight image of the Eiffel Tower. The problems are not so apparent when looking at the image in the small size here, but when printed at sizes of 24 inches-plus, a string of overexposed street lamps can be a little obnoxious. My go-to tool (until I can find something better) for reducing the glare is the “Highlights” slider in Adobe Camera Raw (ACR). The starting image is shown below and is the unprocessed RAW image with no changes. I should add that the final image, shown at the end of this post is actually a Photomerge with one other image, which explains the slightly wider field of view. But both images were treated the same. The two images were photographed at twilight and the numerous bright lights complicated the exposure because much of the scene was not well illuminated. I chose an exposure that would provide at least some detail in the darker areas, knowing that further refinements could be made in ACR. (Technical data: Nikon D800E on tripod with 24-70mm f/2.8 lens extended to 31mm; exposure: 5 sec. @ f/16, EV= -0.67, ISO 400). The small aperture was necessary to get a hyperfocal effect, maximizing the depth of field. Although it is somewhat hard to see at the small size here, the street lamps, carousel lights, and the Eiffel Tower itself are somewhat blown out. 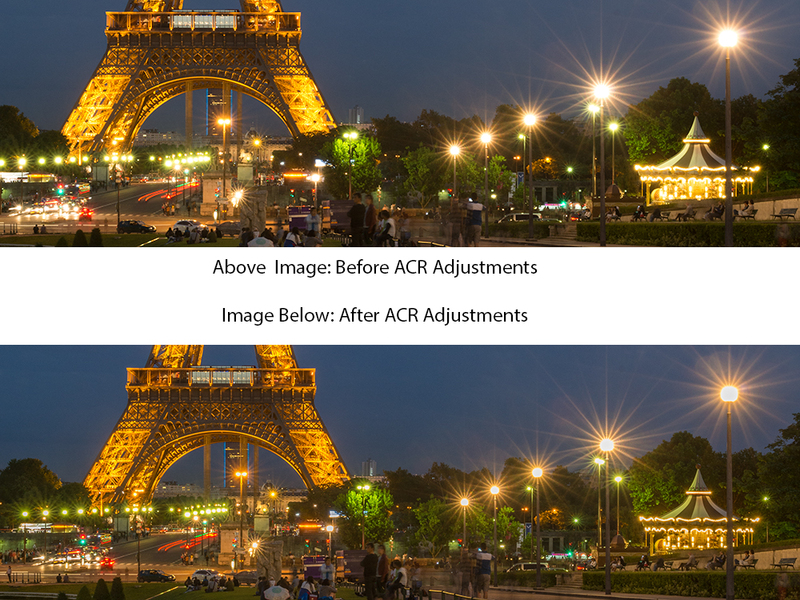 Once downloaded into ACR, a number of adjustments were made to compensate for the initial exposure. The results are shown in the image below. lights, vehicle lights, and the Eiffel Tower all have a harsh glare. After the adjustments in ACR, the effect is less pronounced. One last note; the “star effect” on the street lamps is a result of the chosen aperture (f/16), not a special filter. In twilight scenes such as this, I find that this optical effect is more pleasing to the eye of the viewer than an unstructured flare around the bulb. With the ACR adjustments finished, the image was photomerged with another that had received an identical treatment (for more on Photomerge techniques, check my post of August 1st here.) There was a little clean-up work undertaken, but no major Photoshop steps after the merge were necessary. The final image is shown below. Again, I would to thank Stacy Fischer for keeping this forum running. Please check out the excellent submissions by the other contributors at her Visual Venturing blog. 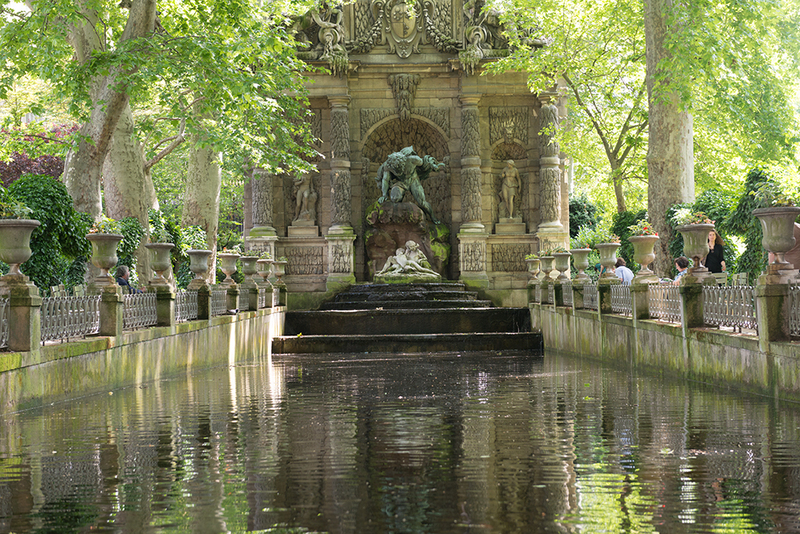 This week’s image is a detail of the Fountain de Medici, located in the Luxembourg Gardens in Paris. 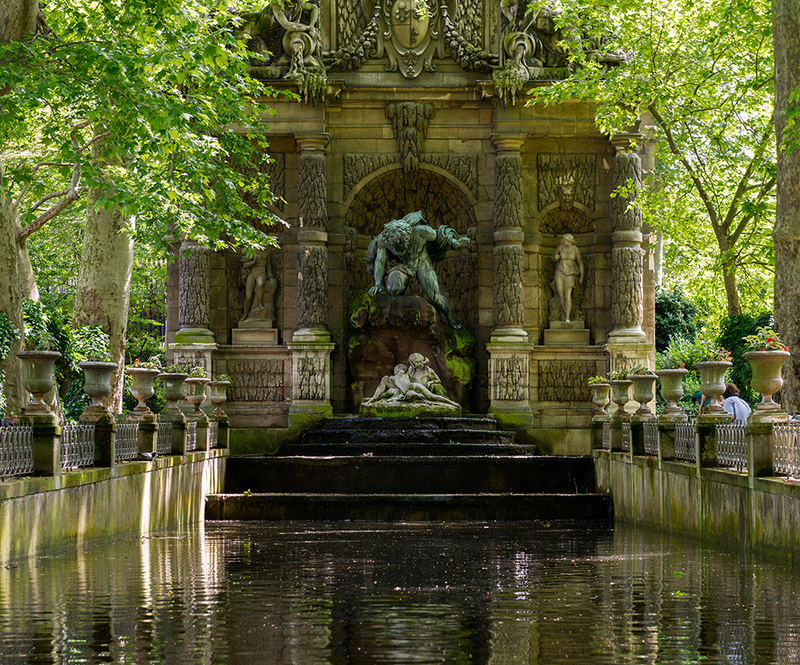 The historic fountain, despite its desperate need for a major clean-up and repair, is a popular stop for tourists and when there is nice weather, many locals take advantage of the well-shaded chairs beside the long rectangular pool. 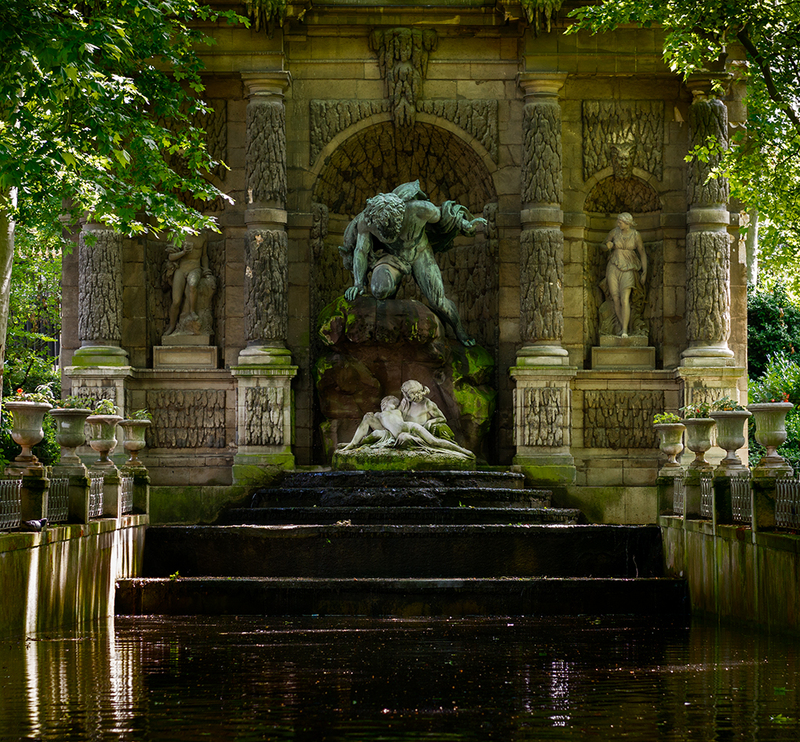 For me, the neglected state of the structure with its moss-covered stones seemed to enhance the horrific theme of the central group of statues. The great dark figure looming above the young lovers is Polyphemus, the one-eyed giant who, according to Homer’s tale, devoured several of the crew members of the Odysseus expedition when they landed on the island of Cyclops. The original image is shown as the RAW file came from the camera, before any changes were made in Adobe Camera Raw (ACR). A quick adjustment to remove the slight tilt was made using the crop tool. 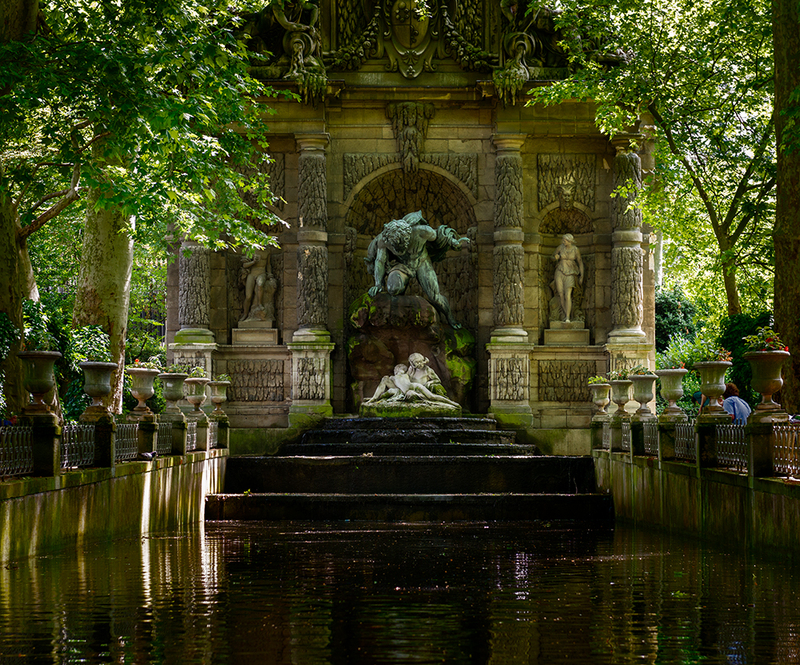 Then a much tighter crop was made to bring the central statues closer, eliminating distractions such as the large body of water in the foreground and most of the people along the sides of the pool. At this point the statues have become the main point of interest as shown below. But more work was needed. I used a Curves layer adjustment (blend mode: luminosity) to darken the scene and inject a more somber mood. A mask was added to keep the statues unaffected by the curves adjustment with the intent of giving depth to the scene and drawing the viewer’s eye to them. This was followed by another Curves layer adjustment (blend mode: luminosity) to create a vignette, darkening the areas outside the center, in an attempt to further enhance the mood. The result at this point is shown below. Things were looking better, but it seemed that one more step might help. One last crop was applied to bring the viewer closer to the scene and eliminate the bystander with the blue shirt on the right. The final image is shown below. Weekend nights are pretty lively in this city. Even before the sun has set, the party spirit is gearing up. The banks of the Seine are lined with thousands of young people assembled in small groups sharing food and various liquid refreshments and generally having a great time. The expansive lawns of the Champs des Mars and Esplanade des Invalides are similarly packed, but populated mostly by families and Frisbee tosseurs (not a real word). The streets are filled with tourists, stopping every 20 meters or so to photograph the city’s icons and the now obligatory “selfies.” And this photographer heads to the Pont Alexandre III, considered the most elegant bridge in Paris. 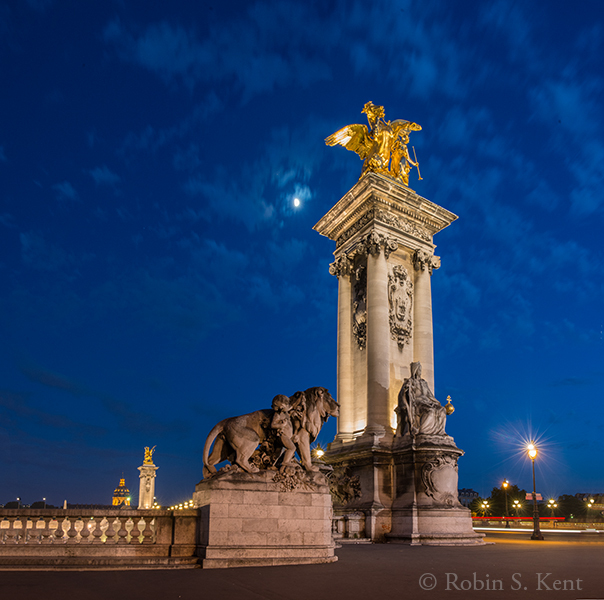 This was photographed from the Right Bank at the entrance to Pont Alexandre. The entrances on both sides are flanked by a pair of pillars such as the one shown here, each with a sculpture of Pegasus, the mythological flying horse. It was shot at about 10:40 PM. This was also photographed from the Right Bank, about 25 feet to the left of the previous image. In the bottom left, you can see the groups of young people celebrating the evening. In the distance, the illuminated dome of Les Invalides sits astride the massive Esplanade des Invalides. The two pillars on the left bank flank the entrance on the opposite side. Photographed at about 10:50 PM. 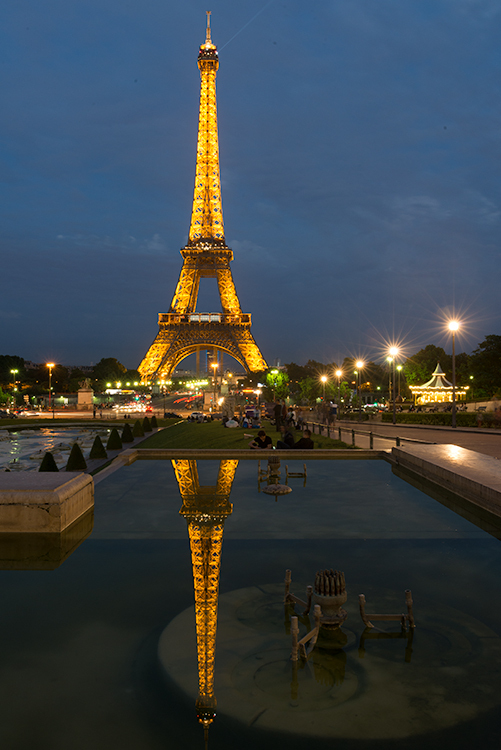 And, of course, the obligatory image of the Eiffel Tower. Photographed at about 10:25 PM. As you can see, I am steadily working my way downriver. My travels about this city have been facilitated by the incredibly useful (and free) app by the Paris Metro system. It knows where I am and I just tell it where I want to go. It directs me to the right bus stop and tells me which bus to take and where to get off. So I knew when I was taking that last shot at 10:50 PM that I could get across the bridge to the bus stop on the other side and catch the 11:00 PM 63 bus that would drop me off abut a block from our home base. If you are coming here and don’t already have it, you must get a copy. Just go to the App store and ask for the RATP app. 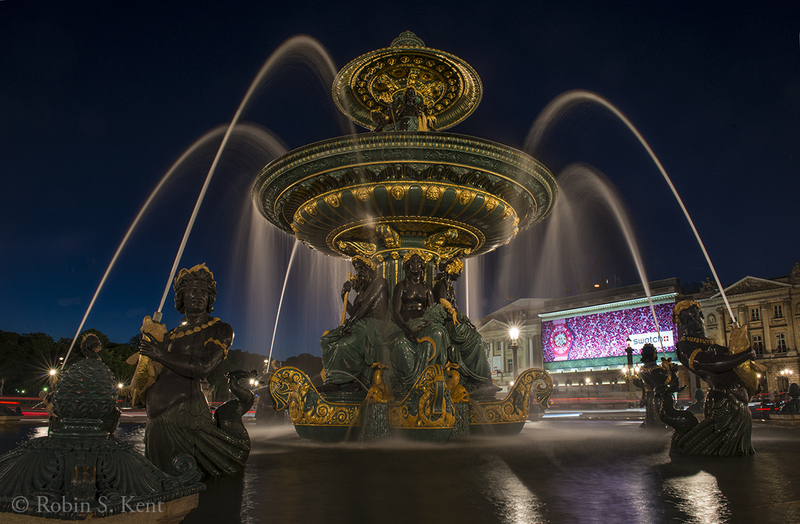 The Place de la Concorde is the largest square in Paris and is best known for its obelisk with the golden tip. But the obelisk is flanked on the north and south by a pair of ornate fountains and I have been trying to get a decent picture of one of them for seven years, ever since I first saw them. It’s always been something: fountains turned off, lights turned off, lousy light, etc. In fact, when I came here late yesterday afternoon, it looked like it might be a repetition of the same story. The south fountain was both dry and dark. But the north fountain was running. Now, I only had to wait and hope they would turn the lights on when it got dark. Fortunately, they did and the image above is the result. The building in the background is the Hotel de Crillon which apparently is being renovated. The brightly colored design is actually a scrim to hide the unsightly construction work. In the past, these scrims were graphic designs, often a replication of the structure being repaired, but now the French have taken the opportunity to help finance their renovation projects by renting the scrims as advertising billboards. In this case, the company is Swatch. 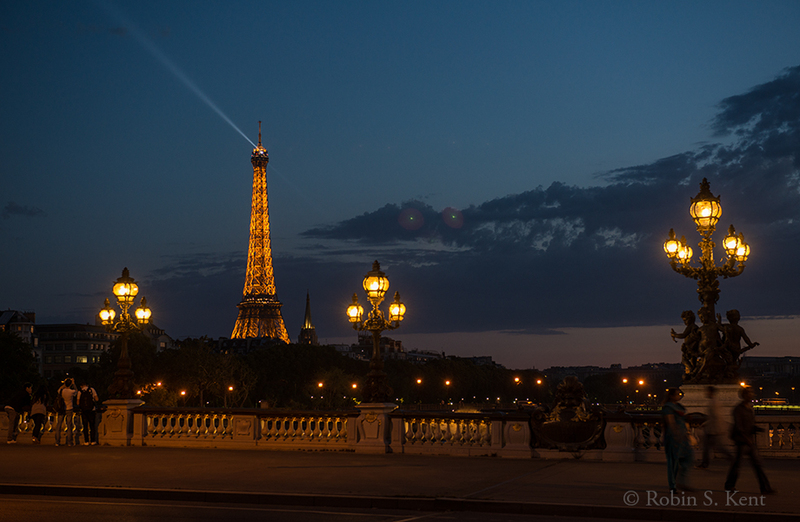 Photographed from the Pont Neuf Bridge at about 10:45 PM. (Technical Data: Nikon D800E on tripod with 70-2000mm f/2.8 lens. Exposed at 1/5 sec. at f/2.8, ISO 800) Normally, I prefer to shoot at f/16 to maximize depth of field, but the motion of the search light made this impossible. So two images were taken, one focused on the dome of Les Invalides to the left and one on the Eiffel Tower to the right. 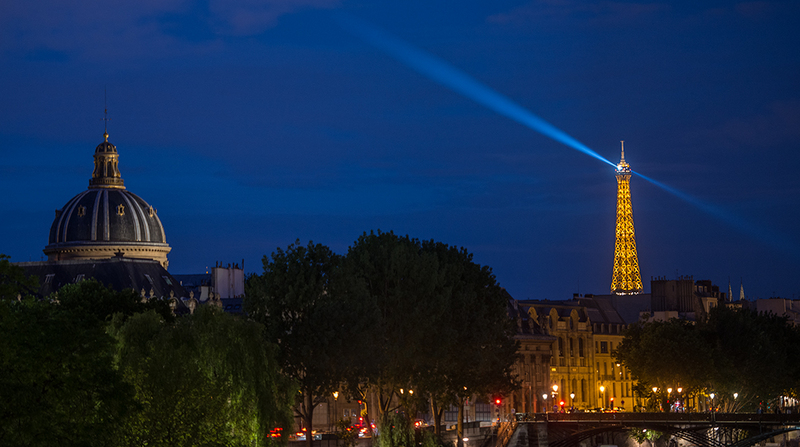 The framing of the left shot excluded the Eiffel Tower and the right image excluded the dome. The two were then combined using the Photomerge tool in Photoshop CC.